Erkut Tokman Turkish poet, actor,visual artist and translator was born in İstanbul in 1971. He used to live and work respectively in London,Bucharest,Milan and Istanbul where he studied poetry, modern dance and acting yet he currently lives in İzmir. 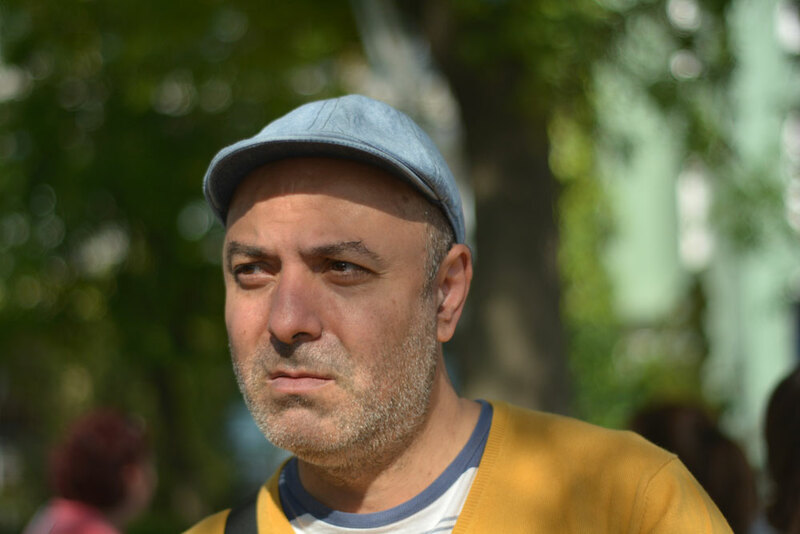 He works as editor in Yasakmeyve-literary review. He is newly elected president of İntercultural Poetry and Translation Academy of Turkey (IPTAT) and the member of Turkish and İtaly P.E.N working in WiPC (Writers in Prison Comittie). He was known as a major translator from Romanian and İtalian poetry in Turkey whose works published all leading literary reviews of Turkey covering more than 60 contemporary Romanian and İtalian poets besides some clasical ones such as Guiseppe Ungaretti, Mihai Eminescu, George Bocavia, Lucian Blaga, Tudor Arghezi, Nichita Stanescu etc.. He is a leading literary interviewer of Turkey whose works were internationally acclaimed and published, among those can be considerably counted Orhan Pamuk, Joyce Carol Oates, Adonis, Aslı Erdoğan, Milo de Angelis, Knut Odegard, Slobodan Dan Paich, Manrico Murzi. His poems, articles and also short stories published at prominent literature magazines of Turkey such as “Hürriyet Gösteri”, “Varlık”, “Kitap-lık”,“Yasakmeyve”, “Özgür Edebiyat”,”Ç.N” etc. since 1996. His poetry books :“Giden ve Kalan”-1999-Liman ( The Arrivals and Departures -Liman Publishing House), “Bilinmezi Dolaşan Ses”-2007-Yitik Ülke ( A voice that strolls into obscurity-Yitik Ülke Publishing house.) “Aramızda Eski Bir Masal”(Among us an old fairy tale-2015-Yasakmeyve-Komşu publishing house.) and “Şehirlerle Yanar Dünya” ( World rekindles cities-2017-October-Yasakmeyve-Komşu publishing house). He also translated six poetry and one drama book including Knut Odegard’s selected poems from English ; Milo De Angelis from İtalian and Gianina Cărbunariu from Romanian; his last poetry translation book from Sebastiano Grasso published with the preface of Yevgeny Yevtushenko and drawings of Adonis. He was on the advisory board of “Roboski” Human-right’s museum. He took part in various poetry antologies, collective books in Turkey and abroad, as well participated literary events and festivals in different countries. His poems were translated and published in U.S.A, İtaly, France, Norway, Lebanon, Romania, United Kingdom, Brasil, Avustralia, Azerbajian, Irak.